The deets: J.Crew Factory blazer; J.Crew dress (old); Kelsi Dagger pumps; Piperlime necklace (old); Fornash & South Moon Under bracelets. I'm always looking for ways to stretch my closet. It is especially hard when sometimes I feel like I live in two very distinct and separate worlds that are either strictly work or play and don't meet in the middle. One great way to get some of these pieces to co-mingle is to throw a blazer on. This dress which was last seen here goes from a weekend only item to work appropriate with the slide of my arms into this linen blazer. Magic! I love this dress (outfit) and could totally picture it sans blazer with flips flops at a vineyard. You clever thing, you look great! STOP being so freaking gorgeous!!!! And I you hair is just not fair!!!! But I love you nonetheless! I do the same thing with "weekend" dresses. I throw a blazer on it and every thing is good to go for work. I love this look! LOVE this outfit. It's so perfect. And I always look to remix clothes in my closet too! you are too pretty! i totally agree, sometimes it is so hard to pair work outfits + play outfits! def agree that a blazer can help separate the two. love this look! Pure perfection!! I love it. Linen blazer are the way to go! So pretty! I love ur bun! LOVE this! Definitely one of my favorite outfits you've shown...love the colors. It all just flows so smoothly. This dress is so perfect on you! You look especially great today! ohhhhhh my gosh this is gorgeous! The color of your dress is lovely. I love how you paired it with the nudes so that it really pops! This outfit is one of my all-time favorites. Really. The classic silhouette with a twist, and gorgeous colors! Love the blazer and necklace in this post! P.s. Happy belated Birthday! Mine was on the 29th (of May) so not too far from yours...I love the Tory flats from your wishlist. I just might have to buy them because brown flats are on my list right now. Whenever I'm putting together outfits, I find I am lacking brown ballet flats and brown boots, and the ones from your June 1st post are really cute. You look so cute! And your make up is always flawless. I love the blazer look! 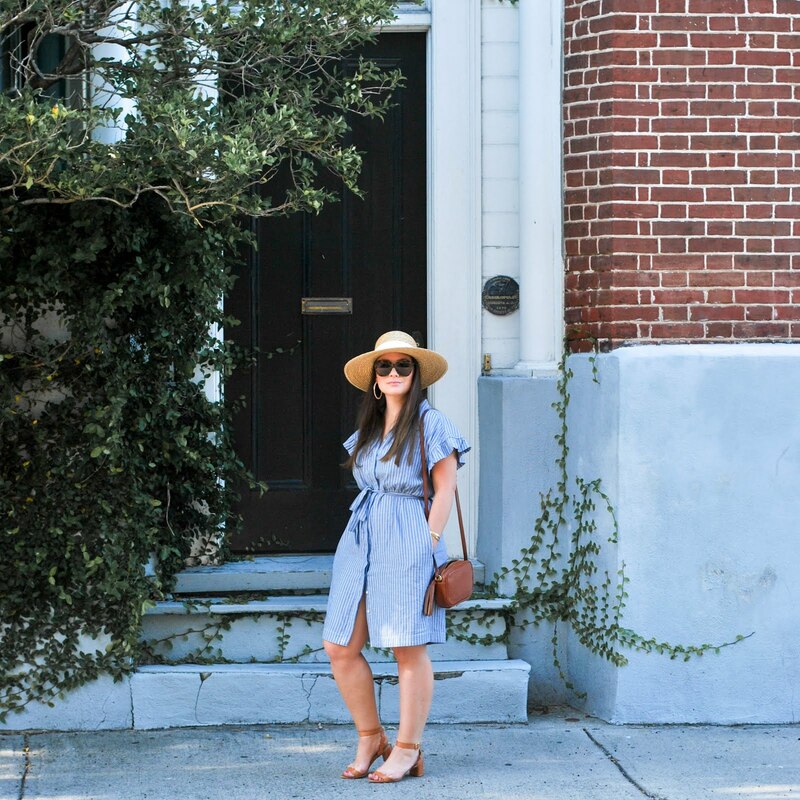 It really can take a summer dress into a work dress. Plus, I love your hair in this one! Love the dress with the blazer! I threw on a blazer with my weekend dress today for work too :) your hair is gorgeous like that!! The soft colors are so pretty on you, Erin! You could also have a more casual look by pairing the dress with some flats. Your hair is so amazing. I am totally envious of it right now! I put a blazer over anything. It is just so easy and instantly looks put together (unless I am just a mess that day. Then not even a blazer can save me). Erin you look SO pretty! Love the blazer/dress combo - so cute, and definitely work appropriate! Erin, I adore this look on you! So pretty dear! This is so pretty! I love this great polished look. I'm in love with this dress. I'm in love with this whole outfit, you look beautiful! Oh I do the exact same thing for work! I always mix a weekend dress with a blazer or a cardi or a tee underneath making it perfect for work! Loving the colors in this outfit as well! Very feminine and polished. Love it! I love this look! A blazer really can make an outfit go from day to night in an instant. Super cute. I love the idea of using a blazer as a transitional piece. You always look so polished and pulled together, I need to learn your secrets! I love this! Mint is so perfect right now. I just happened across your blog, count me as your newest follower! love this look!! after watching bridesmaids all I wanted to do was wear blazers and dresses like the main character. LOVE both your blazer and dress! SO true lady. Mint is my favorite color too. I want to wear this whole outfit. This outfit is pure perfection, I would gladly wear every single item! Love the combination of beige and mint, looks wonderful! You look so lovely! Your necklace is beautiful! What a lovely outfit, very ladylike! I LOVE your hair here -- tutorial please! :) A blazer and dress is such a sophisticated look. You look great here. i LOVE your hair like this! so pretty, i might have to try and duplicate it! It does look appropriate for work, actually, and yet very stylish. Seriously, I feel a little bugged at women who wear dark pantsuits and try to look as masculine as possible when they're in a position of power. Anna Wintour doesn't do that, and oh, she's powerful. I'm not sure if we met officially at Blogger Blitz DC, but I just wanted to drop by and say hello. As well as the fact that I love your outfit. I'll have to think of pairing blazers with outfits more often now.